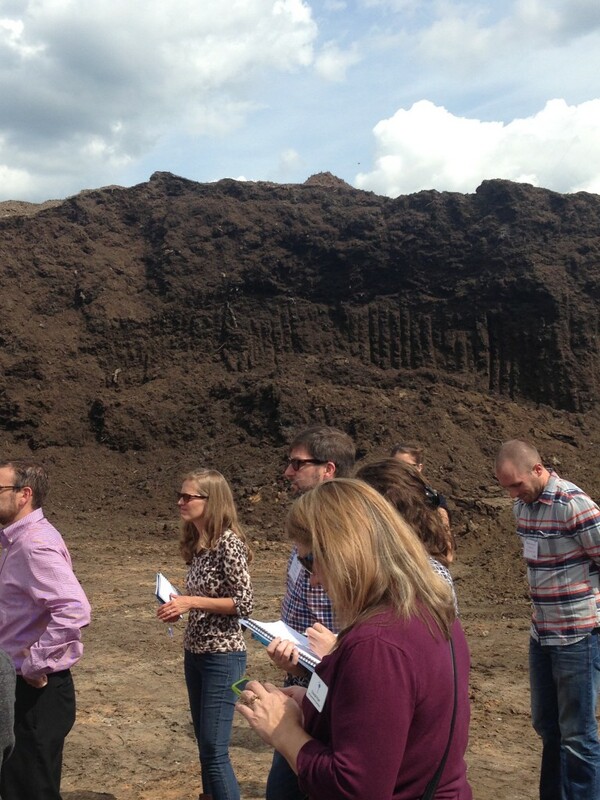 On Day 3 of SPC Advance, Anne Bedarf and Ryan Cooper lead a tour of Earth Farms Organics Composting Operation. Composting at Earth Farms Organics is growing as more local businesses and institutions recycle their food waste. Mr. Lanier expects to see an organics ban in North Carolina within 10 years. Sometimes food waste generators have to be turned away because of contamination. Mr. Lanier stresses that if the organics are too dirty, it is not worth it to accept them. Other obstacles are public education about the benefits of compost and marketing the final products. 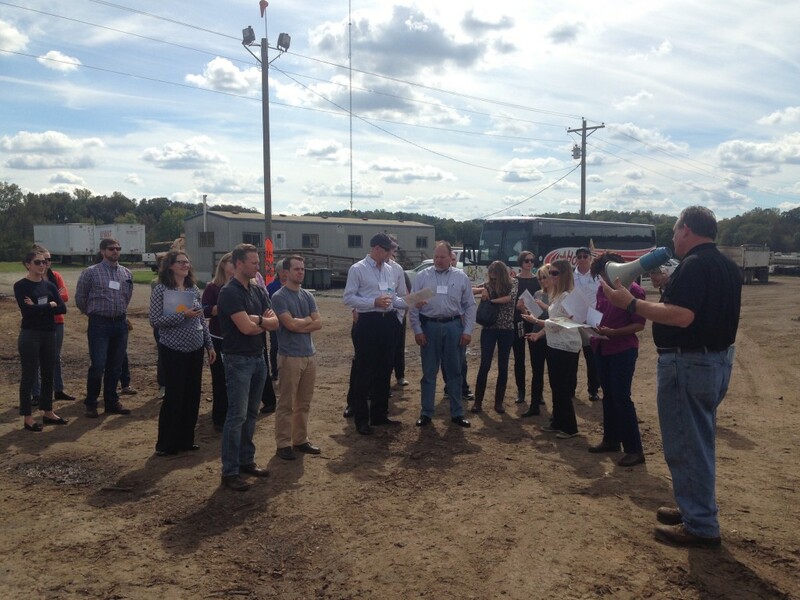 Challenges also include competing with rock-bottom tipping fees at rural landfills. 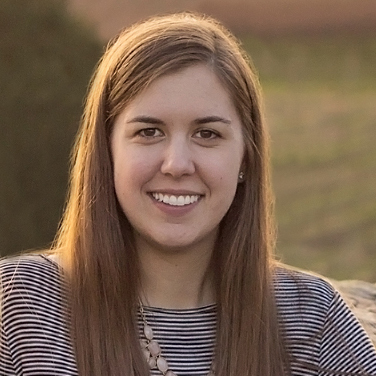 Mr. Lanier believes universities should study the long-term impact of compost addition on soil, agriculture, public health, water quality, and stormwater management. Compostable Bio-bags, cups, and cutlery are no problem in Mr. Lanier’s piles. At the same time, schools and institutions are encouraged to recycle plastic cutlery instead of using compostables, so that plastic forks, knives, and spoons don’t wind up in the pile, creating contamination in the final product. 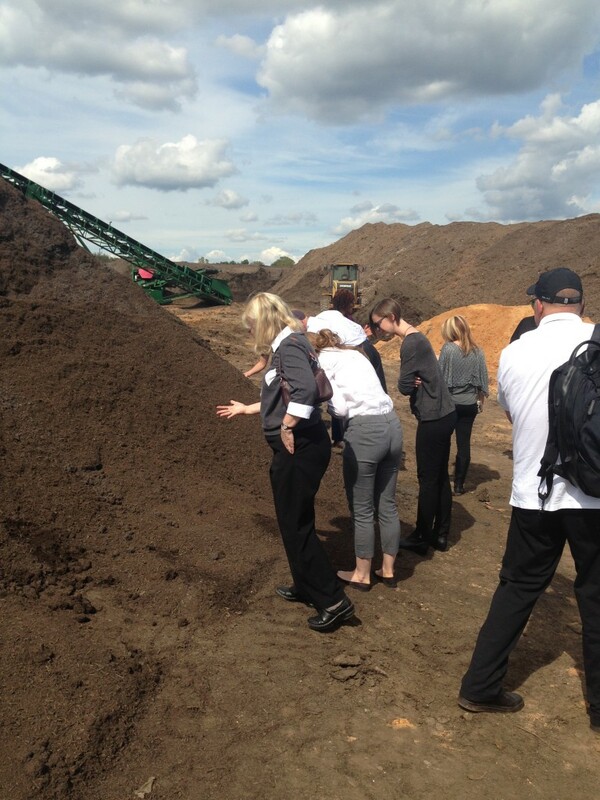 The entire composting area measures roughly 20 acres. Feedstocks are tested for contamination and C/N ratio when they are first introduced to the process. Food waste is accepted into a concrete mixing pit and mixed with wood chips in a ROTO-MIX 920-18 mixer. 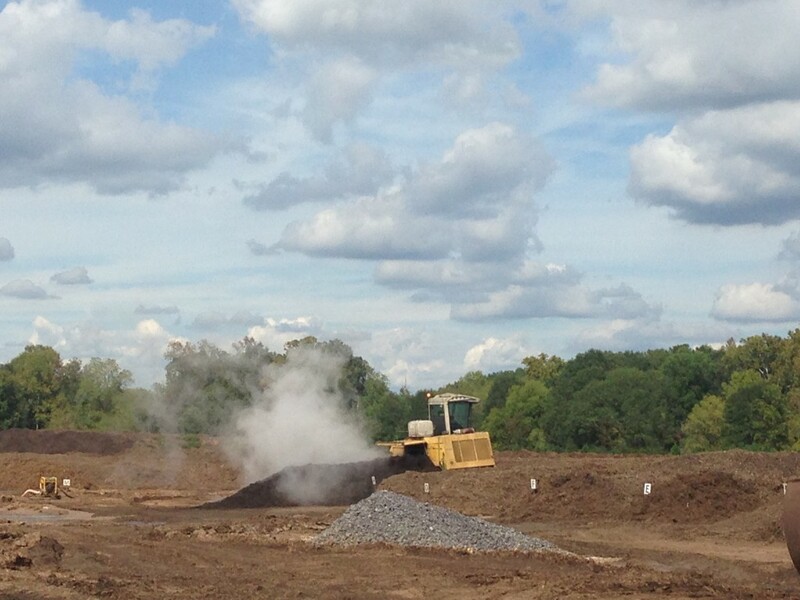 A 6-acre active composting pad is lined with compacted clay. A pond to capture leachate is not necessary since the farm is grandfathered as a land application site. Open windrows, 7 feet high, 16 feet wide and 300 feet long, are turned by a BACKHUS 6-series compost turner. Compost is moved by Caterpillar and Volvo rubber tire loaders equipped with 6-yard buckets. The process includes a 10-12 week active cycle, and 6-12 month curing time. Finished compost is screened to 3/8” with a McCloskey 616 trommel and tested by the North Carolina State University lab monthly. Curing piles measure 20-25 feet high by 50 feet long and contain around 30,000 yards at any one time. Mr. Lanier’s company received a grant from NC DENR to purchase a new organics collection truck. The food waste roll off truck, produced by Brown Industrial, allows multiple collection containers to be emptied into a dumpster attached to a loading arm and then added to the main compartment, which saves time. 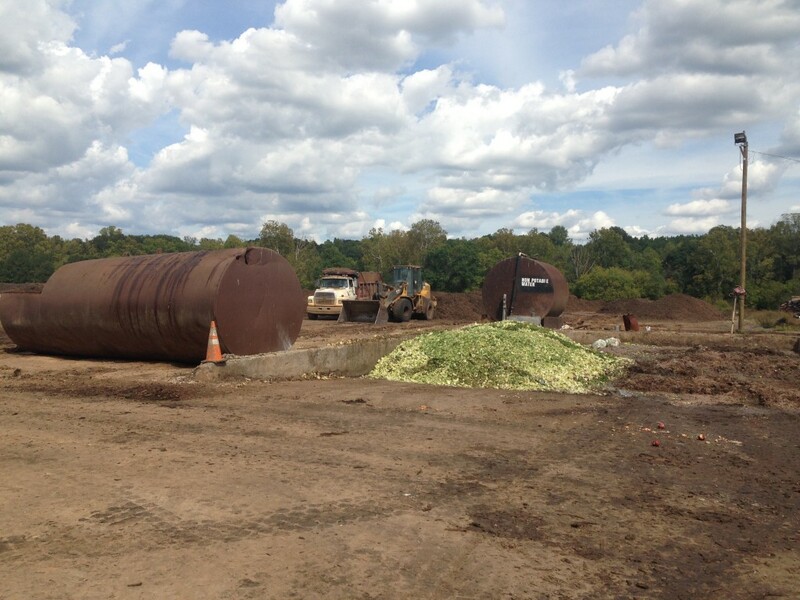 Earth Farms Organics composts roughly 70,000 tons of food waste, FOG (fats, oils, and grease), and wood chips per year with a Large Type III Compost Facility Permit obtained in 2007, Earth Farms accepts 40-50 tons of grease trap solids and 60 tons of food waste per day. Food waste generators include Charlotte-Mecklenberg Schools, Johnson and Wales University, and Charlotte Convention Center. 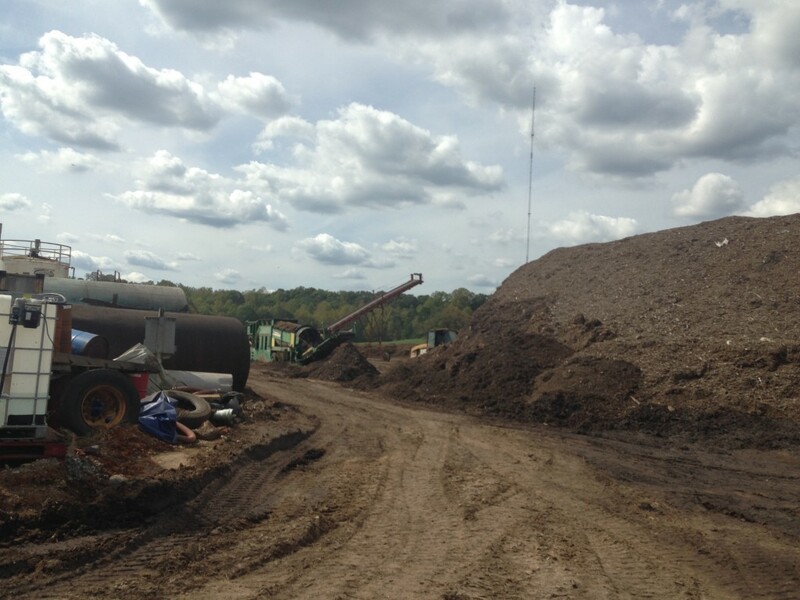 Wood chips are delivered or gathered from land clearing companies and local municipalities. 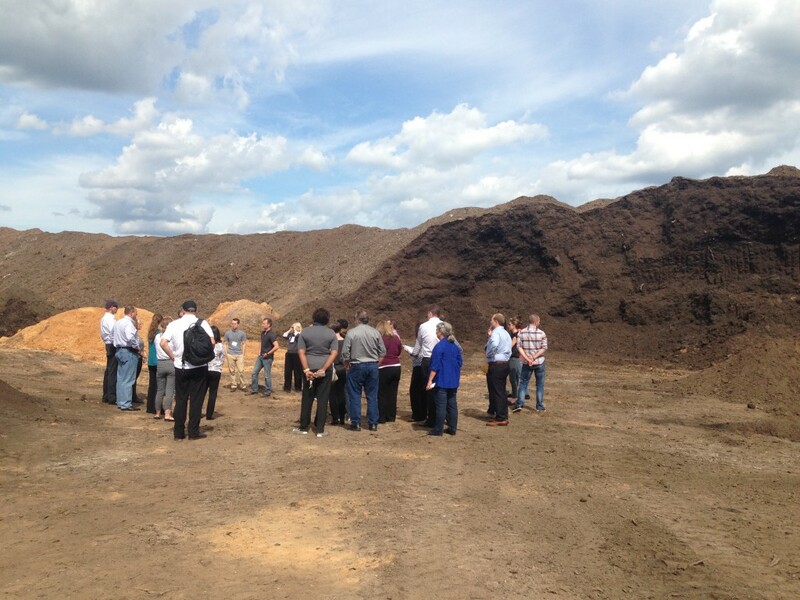 The facility produces roughly 35,000 cubic yards of finished compost per year. 3% of the grease trap material collected by Stanley Environmental is oil used by the biofuel industry.